While some emotions are universal and are experienced in similar ways as a reaction to similar events across all cultures, other emotions show considerable cultural differences in their antecedent events, the way they are experienced, the reactions they provoke and the way they are perceived by the surrounding society. Social norms exist for various aspects of emotions. General emotional norms: what emotions are considered to be good or bad? Feeling rules: how should one feel when encountering a certain event? Display rules: how should one act when experiencing certain emotions? In collective cultures such as China, the feeling rules are rather loose: there are no strict expectations about how one should generally feel. However, the display rules are much tighter: there are certain expectations about the way one should show one's feelings in a given context. For example, Confucian cultures consider expression of emotions (both positive and negative) as a possible threat to the social order. Hence, the norms are of not making a display of personal emotions. One may feel as one pleases, as long as one does not express it. It is helpful to realize that cultural differences can create an emotional reaction in you – especially if either similarities or differences touch your inner- core values. This reaction can be either positive or negative. Positive emotional reactions can include happiness, excitement, joy and high energy. Negative emotions can include anger, anxiety, confusion and helplessness. For example: if you are from a low power distance country and you work with a boss from a high power distance country you may feel anger and resistance when this boss “orders you about”. Although he or she may not in-tend this, you may feel humiliated and not taken seriously. Don’t worry, nobody expects you to be in complete control and as cool as a cucumber when dealing with a different culture. It is quite normal to experience frustration or communication problems. What you can do is simply prepare yourself and be aware that greater uncertainty is a normal part of intercultural situations. Also keep working on your ability to adjust your communication style to the communicative needs of people from other cultures. It is important to be open to learn from your mistakes. On the next page you will find impressions from a blog describing how this works in practice. Tip from Carl the Carrot: Try the following exercise: Close your eyes and recall the first time you experienced a geographical or cultural difference. What did you feel? What did you think? How did you cope? What can you do if uncertainty is very high and it is more difficult to remain cool and adapt your behavior efficiently to the intercultural situation? Sometimes high uncertainty or overwhelming feelings of frustration may take over, and influence your behavior in a non-effective way. If you are someone from a low power distance country with a boss from a high power distance country who “orders you about”, may mean you be-come angry, react defiantly and finally stop listening to his orders and ad-vice. What to do? The Rational Effectiveness Training (RET) is a method that can help you to improve your way of dealing with intercultural situations that cause stress, frustration, and non-productive behavior. The basic principle of RET is the following: Not the situation as such, but your ideas about the situation determine how you feel and whether you experience stress. The RET distinguishes between effective and ineffective emotions. Effective emotions are emotions that give you energy, and help you to get into action. Ineffective emotions cost you a lot of energy, and may lead you to behavior that does not bring you closer to your aim. Effective emotions and behaviors fit the situation and help us to reach our goals. You are less likely to reach your goals with ineffective behavior. About the author: Jim Morris is a senior facilitator and project manager for Schouten Global. He lives and breathes culture: English by nationality, he lives in the Netherlands and works all over the world facilitating professional learning and development. His latest book The Eight Great Beacons of Cultural Awareness (is a practical guide and will strengthen your cultural awareness) is available as e-book here. Your thoughts, namely the way you interpret a situation are responsible for your emotions. Your emotions in turn influence your behavior strongly. It is not the situation in which there is a cultural difference that makes you feel frustrated, but rather the way you think about it and interpret it. Is this thought helping me? Is it true and/or logical? This process will enable you to formulate more rational and helpful thoughts, that will influence your emotion, and make you feel less stressed and/or frustrated. For cultural perfectionist thoughts: People are human beings, we are not perfect, and so I will just try some behavior that appears okay to me in this situation. I will tell them I am not sure whether this is according to their cultural norm, and then see how they react. For cultural disaster thinking: In his culture this behavior seems to be acceptable, so it is not a dis-aster that I am managed this way, and somehow we will make this project work. For low cultural frustration tolerance thinking: Okay I do not like his ordering me about, but I’ll survive… I can stand this, and my colleagues will also survive. I can always try to explain to him that his behavior is not motivating me. For cultural love addiction thinking: Okay, not everybody has to like me or always has to show me that I am respected. He may not pay me as much respect as I would like to get, but it does not mean that he hates me… My contribution is still needed; I will just do it, and live with the fact that he behaves like this to all his employees. For cultural moralistic thinking: For my own cultural norm this is not acceptable behavior, I really be-lieve people should be treated as equals. But in this culture, orde-ring about is normal. I am most likely not going to change this culture by demanding they should follow my norms. So I will stick to my standard, and explain it. It would be nice if they could understand that. I can understand their standpoint, they may not change their view, but at least I can be honest with myself and my value. 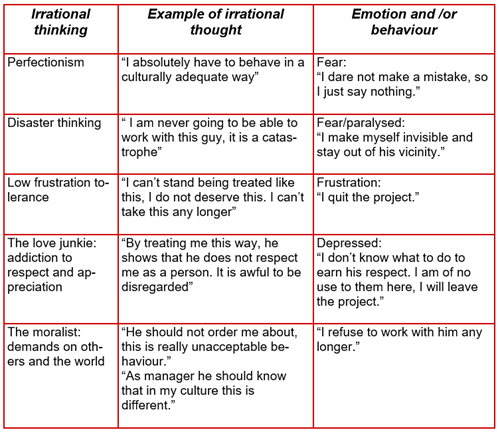 To conclude on the RET method and how it can help you dealing with intercultural situations: Effective emotions and behaviors fit the situation and help you reach your goals. You are more likely to reach your goals if your behavior is effective or appropriate to the situation. The RET method can help you to achieving this goal by helping you to take a more ‘rational’ or effective perspective on your own thoughts. This is chapter 4 from the book With friendly vegetables by Jim Morris. Read the next chapter here or download the book here.